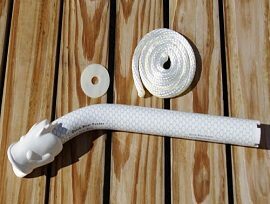 Quick Boat Fender slides into your vessel's empty rod holder, hangs over the side, and locks into place. It is a great looking product that is capped off with a beautiful fish head designed by a local artist, which makes docking easier, and more convenient. 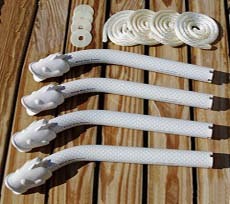 Quick Boat Fender slides into your vessel’s empty rod holder, hangs over the side, and locks into place. It is a great looking product that is capped off with a beautiful fish head designed by a local artist, which makes docking easier, and more convenient. Because of our product’s unique curved design, it takes the fender line to the edge of the boat, so the line does not affect your vessel’s gel-coat paint. Quick Boat Fender is the easiest to use boat fender accessory available, and requires no alterations to your boat, plus, it takes less than a minute to adjust. Once installed, it never needs adjusting again, for most floating docks. 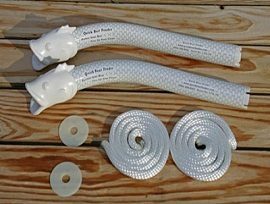 Quick Boat Fender is sold individually, in kits of 2 or 4, and works with all boat fenders/boat bumpers that use 1/2 inch fender line or less, in addition to boats ranging up to 40 feet in size. U.S. Patent No. 7,775,176. Boat fenders not included.